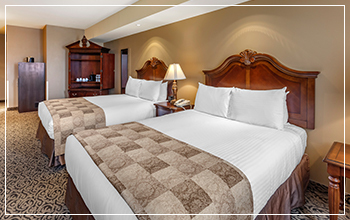 Add superior style and size to your Stratford, Ontario getaway. The Parlour’s superior guestrooms give our guests the additional space that they require to enhance their relaxing vacation. 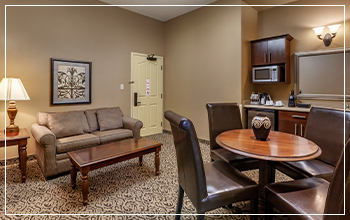 From the moment you walk in, you will see why these rooms are superior accommodations, and why you have made the right choice for your picture perfect visit. Make the most out of your romantic escape or weekend getaway by booking a Superior Room at The Parlour Inn. You and your sweetheart will enjoy the cozy sitting area as a place to unwind and reflect upon the incredible Stratford Theatre performance that you have attended. Share in an early morning coffee or a late night snack from room service as you sit together on the couch and overlook the beautiful town of Stratford, Ontario. Start your morning off with superior comfort, so that you can feel well rested for your day of cultural exploration. From a delicious meal at The Parlour Inn’s Gastropub to a walk through Shakespeare’s Gardens, you will want to start your day off in superior spirits to enjoy every moment of your Stratford getaway. 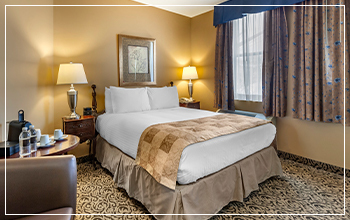 Superior Rooms offer an extremely comfortable Queen Bed with a quaint sitting area for relaxation, romance, or workday preparations. 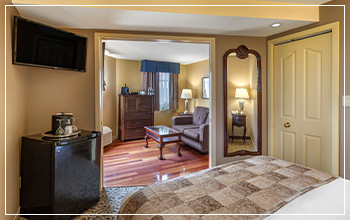 The Superior Rooms also include a mini fridge and spacious 4-piece bath. 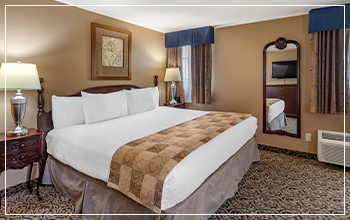 Alternatively, guests may choose a superior room with a King Size Bed and 3-piece bath. Stratford receives visitors from across Ontario who want to indulge in our town’s eclectic appeal. Your view of our historic downtown will enhance your stay in Stratford by allowing you to travel back to a time of simplicity and romance. The view will certainly brighten your mornings before a corporate meeting, and give you and your special someone a spectacular sight as you wish one another goodnight. 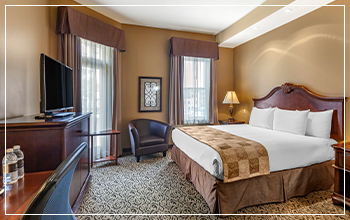 Enjoy a superior stay in Stratford, Ontario. Book now or contact our hotel today and book your exceptional getaway to Ontario’s most picturesque town.